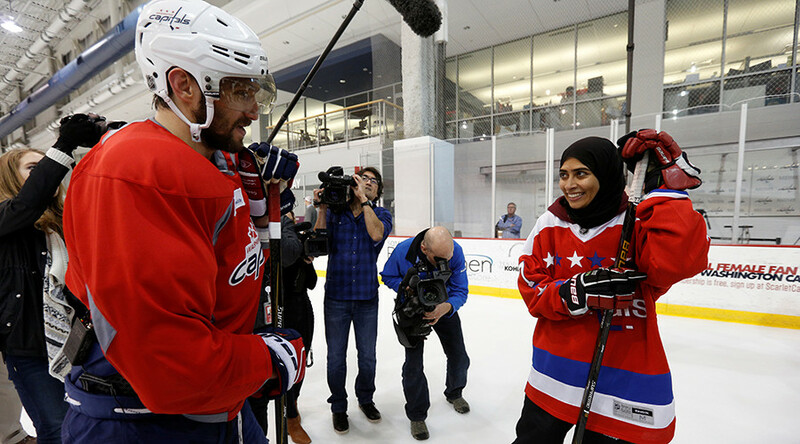 Fatima Al Ali, 27, a female hockey enthusiast from Abu Dhabi, impressed the Washington Capitals with her skills on the ice after she was flown from the United Arab Emirates to meet her favorite team as part of the NHL’s Hockey is for Everyone month. Al Ali was flown to the US where she enjoyed lunch with the team’s executives at the UAE embassy and met with the team’s owner and players. She watched the Washington Wizards and Cleveland Cavaliers basketball match on Monday and then got to see her beloved Capitals beat the Carolina Hurricanes on Wednesday. After watching the team practice, Al Ali took to the ice to show her favorite team her skills. Al Ali got to meet her favorite player, Russian Alex Ovechkin who was impressed by her abilities on the ice. “It’s great. She has a dream,” said Ovechkin when talking to the media following the practice. Al Ali became interested in ice hockey when she was working as a photographer for the UAE men’s national hockey team website. After discovering she had a natural talent for the sport, she began playing for the UAE women’s team. Former Capitals player Petr Bondra discovered Al Ali when he ran a two-day hockey camp in Abu Dhabi in November. "She stepped on the ice with no skates on and she started puck-handling," Bondra said to nhl.com. "I stopped doing the interview and said, 'Hold it. Let me see what's going on here.'" The Capitals and Emirates Airways then worked to bring the hockey player to the US to surprise her in time for Hockey is for Everyone month, which promotes diversity in the game.